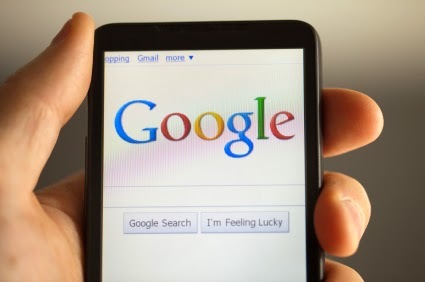 If your haven't already built your website for mobile devices, on April 21 you may find it harder to get google rank in Google’s mobile search engine esults. They've already begun rolling out the new algorithm, and you may have already seen it. Note that the "mobile-friendly" update only affects mobile search results (searches from smart phones and tablets) not searches conducted from a desktop or laptop computer. According to Google, their goal is "to improve searcher experience. It’s frustrating to search on a phone and land on a page that’s so tiny you can’t accurately click the links without pinching and zooming and scrolling to find the right text or links." Sites that are deemed "mobile friendly" will appear higher in the results, which could mean disaster for your business if your audience is is a mobile one. How do you get the Mobile-friendly label on your website pages? To see if your site is mobile ready, you can use Google's Mobile-Friendly Test site. If you already have a site and Webmaster Tools, you can get a full list of mobile usability issues across your site using the Mobile Usability Report. Resolving these issues may be as simple as a text change to your robots file, or as significant as a redesign to make your site responsive to mobile devices. How will this impact my site? This all depends on your current organic search traffic via mobile device, your audience and your competition. The worst-case scenario is that all of the sales-driven organic search traffic via mobile devices disappears instantly when the change happens.This probably won't happen, but you may feel a significant loss. Start by analyzing the affected traffic and sales today and determine the real impact of losing it all. Remember, filter the visits (and sales) so that the data only contains organic search-driven traffic via a mobile device. Then you can determine the impact to your business, or your sales if that traffic disappeared completely on April 21. If you don't currently have much mobile traffic, then getting mobile-friendly will only improve your ranking and may draw in more customers who previously haven't found you on their mobile devices. Spending time perfecting your website's key words? Don't. I regularly encounter clients and even other web designers who are working hard to perfect the meta keywords for their website in search of the ultimate SEO. Search engines no longer use keyword meta tag data to rank or search websites. In fact, more often than not, keyword metadata could even harm your search ranking since sites like Bing use keyword data as a spam signal. "Our web search disregards keyword metatags completely. They simply don't have any effect in our search ranking at present. About a decade ago, keyword meta tags quickly became an area where someone could stuff often-irrelevant keywords without typical visitors ever seeing those keywords. Because the keywords meta tag was so often abused, many years ago Google began disregarding the keywords meta tag." So does this mean metatags are dead? No, not at all. Ranking in Google these days is more to do with relevance, reputation and popularity than meta tag optimisation, but meta tags, when used properly can still be useful in a number of areas not with just ranking pages. The metatag formula is to match the Page Title to the Meta Description and the Page Content. Make sure that the title and description reflect the actual content of the page. Remember, you're trying speak to human visitors, not search index bots. In addition, there are other metadata that Google and other search engines pay attention to such as mobile information and rich snippets (microdata). As I've always said and will keep saying, "Content is King". If your page is rich with relevant data, the search engines will use it. Quality and uniqueness of content is what wins. But what if I have a store that sells, for example, shoes, how do I compete with all of the other stores that sell shoes if my unique keywords don't matter? This is a question we get often. This is where your thinking must change and where you need to focus your marketing on something unique to your store. For example, the old way was to load your meta information with items such as "shoes, shoe store, great shoes, new shoes, air jordans, adidas, online shoes", etc. "Free shipping on online shoes, clothing, and more! 365-day return policy, over 1000 brands, 24/7 friendly customer service. Then be sure those words appear on the page's content. Yes, it's true. The search engine game is now a popularity contest - not a technical one. In addition to relevant, rich content and good structured data, your marketing focus should be on your reach. Get the word out, get on the (oh no!) social networks. The more "popular" sites your on, the more popular and relevant the search engines think you are. It's hard work and takes time... but it's free! Google is the internet's most popular and perhaps most important search engine. In addition to being a top search in itself, it powers the search engine components of AOL and Yahoo to name just a few. So if you haven't figured it out already, you'd better have some understanding how Google indexes and ranks your web page. Contrary to popular belief, just exchanging vast amounts of links with other sites doesn't necessarily make you popular. Getting a link to your site on an already high-rate, popular site does it. If Google thinks Site A is popular, and they link to you - then you are considered popular as well. Link popularity is calculated on all of the pages of your website, so make sure to link to all of the important pages on your website. Google considers your Title and ALT Meta Tags when indexing your page. It does not give much weight or consideration to your Description Meta Tags or Keyword Meta Tags. a. Title Tags: Title tags play heavily in your ranking for a search on Google. Title tags with just your company name on every page are not going to cut it. Or are you a victim of "new page 1" title tags because you forgot to name your pages? If so, go fix your Title tags right now! The Title tag is what appears at the top of a Google search result, so it should describe what your business is all about and should include keywords people would use to find your site. Google will read about 59 characters (including spaces) in a Title. b. ALT Tags: Google also reads the ALT tags that are attached to your graphics. They are a good way to include more keywords in your web page. They are also the words that appear when you move your mouse over a graphic (For more information on ALT Tags, see http://www.internetbasedmoms.com/alt_tags.htm). Google searches the content on your site to return relevant search results. Be sure to include relevant keywords in the text of all your pages. Also, try to keep them near the top of your pages - Google may not crawl all the way down your page. For example, if someone would search for your site with the keywords "cloth diapers" - be sure to include those words in your Title tag and near the top of your web page. Having your keywords in your domain name may boost your ranking. Google seems to favor sites with keywords in their domain. For example, if you search for "diaper" on Google, the top results have the word "diaper" in the domain name. These are the beginning basics of pleasing Google. Wait a few weeks for Google to index the changes and see what works and what doesn't. Remember to check often, change often and always keep on top of your efforts!